A traditional Bakewell tart is made up of shortcrust pastry with a layer of jam and a sponge filling with almonds. This shouldn’t be confused with the Bakewell Pudding which is made with flaky pastry, a layer of jam and an egg and almond filling. 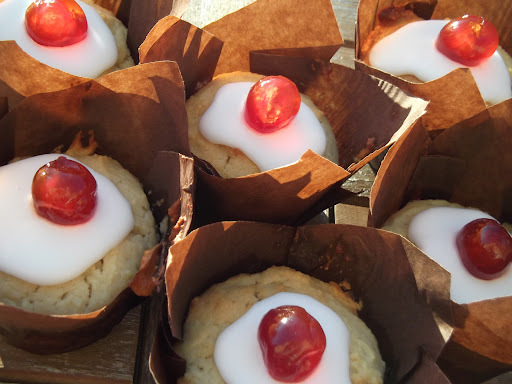 The best bakewell tarts come topped with fondant icing and a glace cherry on top! The key to both of these dishes is the use of almonds. I’ve really gotten into ground almonds recently, I think they’re excellent to bake with giving an extra rich flavour and a moistness that can’t be achieved using flour alone, so I decided to incorporate them into a muffin sponge, but where there’s almonds, there must be cherries and glace icing!!! And so the Bakewell Muffin was born. Now…don’t judge…but I’m a big fan of glace cherries! I know they barely resemble the real deal, but the’re so sweet and sticky what’s not to love? The recipe lists “cherries” in general…but if you love glace cherries too go ahead and stick one of them on top! If not, feel free to use fresh…though its probably a good idea to pit them first. You may notice a few other slightly unusual ingredients on the list for example greek yogurt. I used 0% fat greek yogurt as there is plenty of fat in the sponge coming form the butter so the yogurt is really there for moisture – think of it as an extra creamy and rich version of milk in a normal muffin batter! I think it really adds to the flavour and I will be experimenting with greek yogurt in muffin batters from now on. 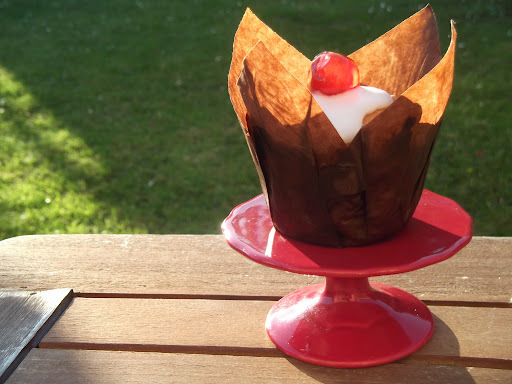 My family loved these naughty muffins, they are lovely and rich and moist and sweet and are a perfect summer treat. 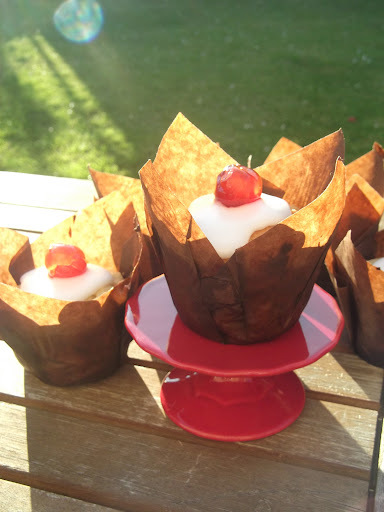 Firstly pre-heat the oven to gas mark 5 and line muffins tins with pretty muffin cases. In a large bowl whisk up the egg then stir in the sugar, butter, and yogurt. Once fully combined tip in the flour, ground almonds and baking powder and fold. The mixture should be a little lumpy. If the batter is too thick add a splash of milk! Place a large tablespoon of the batter into the muffin cases and then place a large teaspoon of jam in the middle. Top with another large tablespoon of the batter so that the jam is kept in the middle of the cake. Put the muffins into an oven for 20mins on gas mark 5 or until golden on top! Leave to cool on a wire rack before decorating. To decorate mix up some thick glace icing and spoon over the muffins. While still wet place half a cherry on top, just like a bakewell tart!